Beavercreek faced the Sycamore Aviators in the opening game of the Springboro Shootout on Friday night at South Metro Sports. It was the first meeting of the two SWOHSHL clubs, who are in the same division. 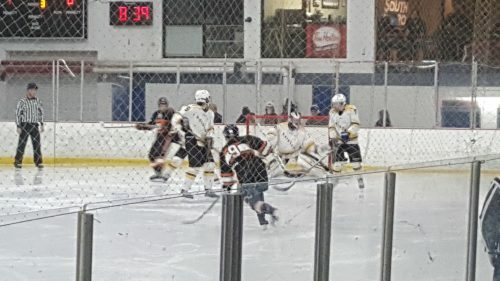 Creek started the game a bit flat and Sycamore took advantage and scored the game’s first goal midway through the first period. 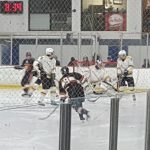 The game was tied going into the third period, when freshman Braden Cox found himself in front of the Avs’ net with the puck on his stick and promptly buried it to tie the game at one. The game ended in a tie at regulation, however, since this was a SWOSHL league game a 5 minute running clock 3-on-3 overtime was played. This is a new rule for SWOHSHL play and the fans were thrilled to witness it. Unfortunately, the Beavers took a penalty midway through the OT and the Avs made them pay with a game winning power play goal. Gram Doherty was sharp for Beavers in net and turned away 21 shots. Next up for Beavercreek are two games on Saturday against two different Panther teams. The first will be played at 8 AM against the Springboro and the second will be against Elder at 5 PM.